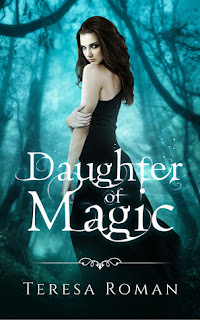 Welcome to my stop on the Daughter of Magic blog tour! Below you find information about the book, my review and a giveaway. Be sure to check it all out. I enjoyed the parts of this book that took part in the magical world. The imagery of the world was beautiful, the magic was enthralling, and the action was exciting. I just wish there was more of the book that took part in the magical world. The main character Lilli has suffered a lot and I found myself sympathizing with her. I liked Devin, the love interest in this book. However, he was a bit too mysterious to me and there were a few times where he was just a little over the top with his protectiveness. I loved the scene where Lilli finally experiences her magical abilities. I always like it when characters are all of a sudden able to do something. I love it when stronger bad characters try to do harm to or take advantage of the newbies and then get what’s coming to them. I think future books could be exciting. While I wished for more time in the magical world, it isn’t to say that the time outside of that world was bad or boring. It just wasn’t as exciting. The book just became more riveting once the characters were in the magical world. I look forward to book 2 and learning what all Lilli is capable of doing. Please note that I was given a copy of this book in exchange for my review. Thanks for hosting me on your blog and for reading and reviewing my book. Thank you for writing it! :) I'm always glad to help authors whose books I enjoy.